The UK’s largest peer-to-peer lender, Zopa, has now lent over £500 million of consumer savings to UK borrowers since launching in 2005. The pioneering lending company has shown significant levels of growth by lending over £200 million (40% of total) in the last 12 months. These record lending levels highlight how peer-to-peer lending is no longer an experiment but a reliable, trusted alternative for thousands of consumers to cut out the banks and get a better deal. Zopa currently has 52,000 active savers lending on average £5,500. With the average saver aged 48, savers are fully embracing peer-to-peer lending as a predictable way to look after their financial futures. Interestingly, Zopa expects to hand back over £20m in interest from borrowers this year alone and has helped deliver £30m in interest since it launched. Zopa is calling on thousands of consumers to ditch their underperforming ISAs and banks by embracing peer-to-peer lending to get a better rate on their savings. Zopa now has savers lending amounts from £10 to £1.3 million but there is no maximum lending limit. 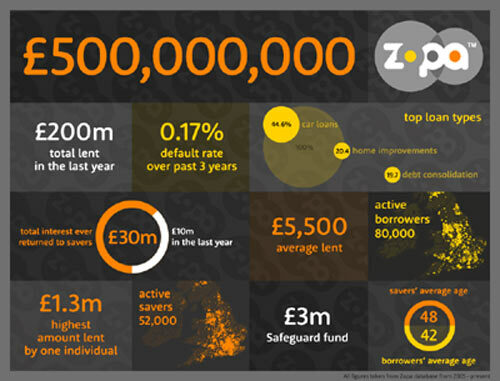 By reaching £500m lent Zopa has proven that peer-to-peer lending is a trusted activity for savers. Zopa has a default rate of just 0.17% on all money lent in the last three years – lower than any other bank or peer-to-peer lender. 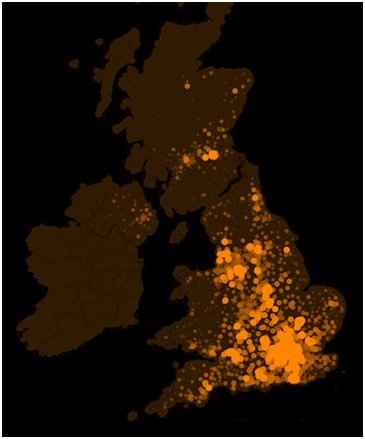 With over 90,000 loans made in total, Zopa has a total of 70,000 active borrowers. A significant 40% of all loans go towards cars and in 2013, £86m were car loans; £39m went towards home improvements and £36m helped people cut down existing debts. Surprisingly, 30% of Zopa borrowers pay their loans back early – benefiting from there being no early repayment penalties. The average borrower is 40 years old and typically borrows £7,500. Giles Andrews, Zopa CEO and co-founder said, “Lending half a billion pounds of other people’s money is a superb achievement for Zopa made possible only by our customers. Our mission is to deliver every saver and borrower in the UK better rates and service, as they deserve. By cutting out the banks and offering returns of 5% (compared to bank savings rates typically under 1%) we are rewarding people for being sensible with their money. Even better to know is that with the protection of our Safeguard fund, no saver has lost money with Zopa. Our borrowers enjoy market-leading low-rate loans and award winning service. Lending the next £500m shouldn’t take another nine years as we expect to reach £1bn lent in the next 12 months”. The UK’s peer-to-peer lending industry is growing at a rapid rate as more savers and borrowers move away from banks. With regulation coming into effect on April 1st and ISA inclusion announced in the budget, Zopa is predicting a huge surge of new consumers and funding to accelerate this growth. Zopa is the UK’s leading peer-to-peer lending company – bypassing banks and their high charges to put more back into the pockets of the UK’s savers and borrowers. Zopa matches smart borrowers looking for lower-rate loans with savers looking for higher interest. Since Zopa was founded in 2005, it has arranged more than £500 million in peer-to-peer loans and has been voted ‘Most Trusted Personal Loan Provider’ in the Moneywise Customer Service Awards for the past four years and Consumer Moneyfacts best overall customer service in 2014. Zopa has over 52,000 active savers lending between £10 and £1.3 million and has a lower default rate on loans than the banks at 0.17% for all money that has been lent in the last 3 years.